This luxury home is aprox 5000 square feet. It has a huge open floor plan with Big views of Stratton Mountain as soon as you walk in the door! Everything about this home is very upscale! Custom kitchen, huge teak island, Viking & DCS appliances. Antique pine floors, heated by radiant heat through out the main level. 2 large stone fireplaces, Huge great room, 10 FT antique pine dining table, large windows overlooking Stratton Mtn, Mahogany deck, barbecue and large New outdoor HOT TUB! 1 50 inch & 1 60 inch Flat screen TV along with Yamaha stereo receivers, Blue Ray DVD and Bose speaker system. There is another large TV area on the bottom floor along with a Pool table, Foosball, Xbox, Wii and Bose system for the kids! We also have a private parking pass. Rentals go email us.. Prime rates apply to all Holidays. We also own numerous high end ski on/ off condos available for rent at Stratton! Ski, Snow Mobile, Golf, and Tennis: Stratton Mountain is the perfect place for family and friends to get together. Over 300 million dollars were invested by Intrawest to develop this Luxury first class resort. Boston, Connecticut, New york and New Jersey are all located with in a couple of ours of this destination! Whether, you come to ski, snow mobile, play golf ,play Tennis or shop in Manchester, you are sure to Love Stratton Mountain! This property is simply the PERFECT home for mutiple families to get together for a memorable Vacation or Event! For years this home has hosted guests and they all come back! Large layout, huge great room, fireplaces, perfect location to mountain or town, big views, gourmet kitchen and hot tub! All Bathrooms have been fully upgraded this year, including beautiful stone tile work, custom vanities and soap stone tops as well as high end faucets. We are constantly upgrading all aspects of the home! Huge Great room on main floor and second Den on Lower floor with large flat screens and more! one Keureg Coffee maker....Please bring K Cups! High end huge kitchen, all top of the line appliances, antique pine custom cabinets, Huge Teak island. Large Mahogany Deck with outside seating and grill as well as Hot tub! This can be found at The Stratton Mountain Sports Club for a fee. Large New 8 person Hot tub! Many of our renters choose to hire a cook and house keeper. We would be more than happy to arrange this for you if possible. Our home also has wide open space and a master bedroom on the main level making our home wheel chair friendly. Normally we do not allow pets, but we might under certain conditions...so please ask. We also have high speed Wireless Internet through out the house. We try to leave things in our home that are normally not found in rental homes such as high end linens, high end cook ware, high end furniture, DVD movies, XBOX games and more. All we ask is that you treat our home with respect and as if it was your own. There are spices and cleaning supplies kept at the house, but we ask that you replace what you use! This makes it fair to all of us! We Do have access to outdoor Pool in the summer!!!! The house was perfect for our weekend away and Anthony made sure he was available to answer any questions we had. Will definitely be looking into coming back ! If you're looking for excess, this is the property! The home is spacious with spectacular views both inside and out. I awoke each morning to a beautiful view of Stratton! Everything is provided; linens, towels, etc., and if you forgot something you will most likely find it there. Many rental properties are furnished with items resulting from upgrades of owners’ primary homes, but this home is much different; it is equipped with premium appliances and furniture--nothing but the best!!! The owner is a pleasure to work with; Communication is friendly, efficient and designed to maximize the pleasure of your stay! The price of the rental is less than the value and comfort provided. If you want luxury, this is the ultimate property. The location is perfect: centrally located between Bromley, Stratton, Snow, and others. I will definitely book again!! Thank you Anthony; we appreciate your hospitality!!! The house was very comfortable and everyone really enjoyed their stay. Beautiful view of the mountain from the windows and deck. Owner was great to work with and helpful. There is nothing about this house that our party of 11 didn’t absolutely fall in love with. 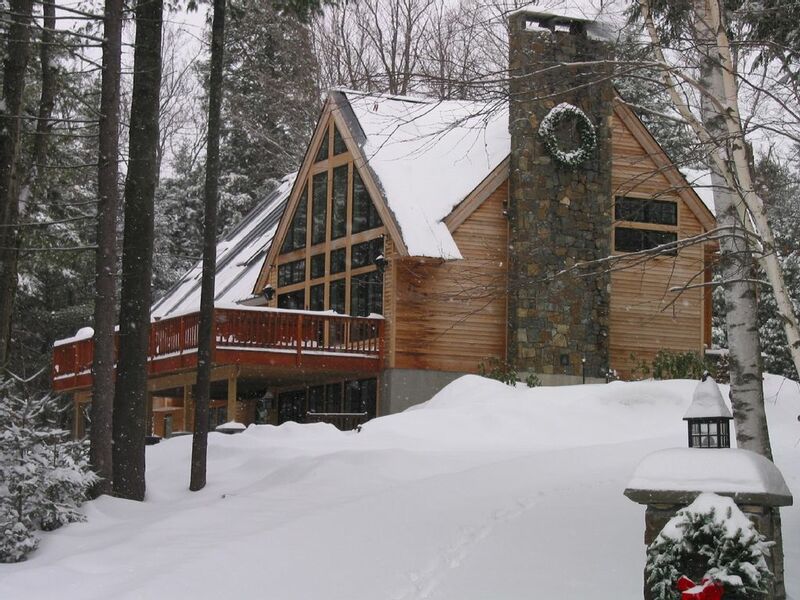 The comfort of the huge overstuffed chairs and sofa in front of the enormous fireplace, the gorgeous Ralph Lauren-esque decor, the all-glass side of the house facing the ski trails on Stratton Mountain… it is spectacular! The kitchen is a chef’s dream. Gourmet stove and ovens, and we loved that things were stored exactly where you would expect them to be. It didn’t take us long to find anything. It was logical. We brought about a metric ton of food and it all fit, with room to spare, in the enormous refrigerator. The hot tub was CLEAN, and enormous. The entire house was CLEAN and enormous. The beds were comfortable, the bathrooms were spotless. The owner was immediately responsive to questions and so helpful! We were so happy to be there and so sad to leave. We will come back again! Plenty of room to separate groups of people. House is in good shape. Golf: Stratton Mountain has 3 beautiful Golf Curses along with there famous golf school. All of which is located just 1 or 2 minutes from my properties. There are also world class courses located nearby, We recommend a day at the Equinox! The Golf course is first class, the restaurants are excellent and the Spa is top notch!